Start reading 168 Hours: You Have More Time Than You Think on your Kindle in under a minute. LAURA VANDERKAM is the author of What the Most Successful People Do Before Breakfast, All The Money In The World, 168 Hours, and Grindhopping. She is a frequent contributor to Fast Company's website, and a member of USA Today's Board of Contributors. Her work has also appeared in The Wall Street Journal, City Journal, Scientific American, Reader's Digest, Prevention and other publications. She lives with her husband and three children outside Philadelphia. I really wanted to like this book. The first few chapters contained some useful ideas, such as tracking your time and prioritising the aspects of your life that you want to move forward in. However, it is written from a very privileged point of view. Want more time? Don’t clean your house - pay someone else to do it. Don’t sew your children’s clothing because some else can do it cheaper - well granted not everyone likes sewing or is good at it, but thinking about where all our cheap clothes come from should come into it. Good quality ethically made clothing is expensive. The author talks a lot about core competencies, but her definition of this seems unclear, for example she sees reading to your child at night as a core competency because ‘no one else can do it like you can’. There was something self righteous in the tone of this book that really irked me. I couldn’t get past ‘never do your ownlaundry again’ ! How are you meant to teach your children self sufficiency if they don’t know how to clean or operate a washing machine. I only say this because this book seems to be targeted at parents. The author goes on and on about how parents in the past didn’t play with their children and how the average American on reads to their children for a few minutes a day. Perhaps it’s because those parents are busy cleaning the homes and doing the laundry of the privileged few! My advice is unless you are one of those privileged few, give this book a miss. 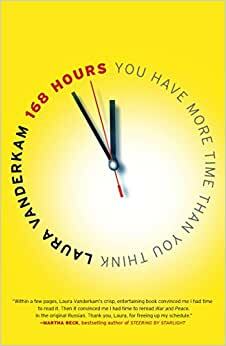 Vanderkam has real insight into time management and isn’t afraid to deliver the hard truths. This book has the ability to affect positive change in your life if you’ll let it. 5.0 out of 5 starsThis book is life changing.